I’ve been sloppy. 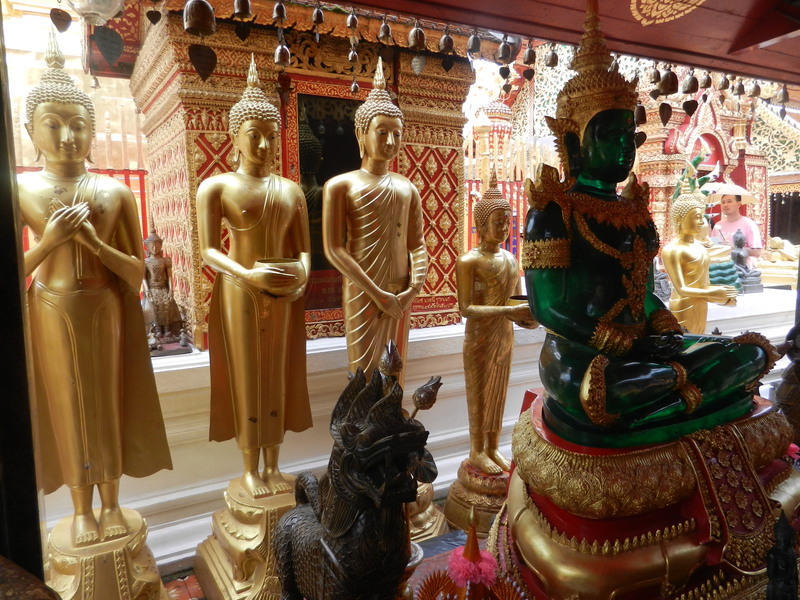 I’ve invoked Thai perspective and Western perspective several times, but perspective is a controversial term. What is a perspective? The word’s origin shows Western preferences that many cultures don’t share. The ancient Latin perspicere meant to look at closely. Mut many cultures conceive vision in other ways, and several focus on other senses than vision. A different way of apprehending the world emerged in Thailand. 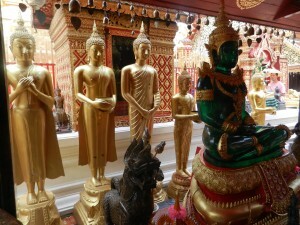 Many Thai temples have so many flowing forms and glittering colors that the eye isn’t drawn to one thing. You’re not encouraged to examine an object’s details closely because there’s such an abundance of shapes and colors that they all flow together. 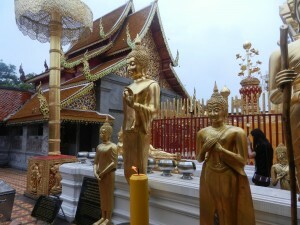 A key aspect of experiencing a Thai wat is flowing motion. People slowly walk around them–they don’t stop and examine details of anything. They stroll around. Some, like Wat Phar That Doi Suthep (which graces all the photos in this post) have a central stupa. 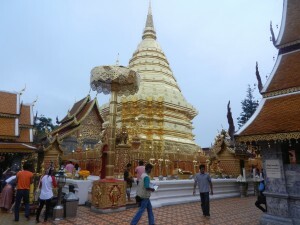 This wat was established on a mountain outside Chiang Mai in 1383, and it’s one of northern Thailand’s most revered sacred precincts. 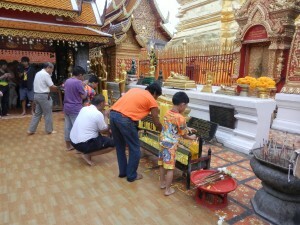 People slowly walk clockwise around the stupa. 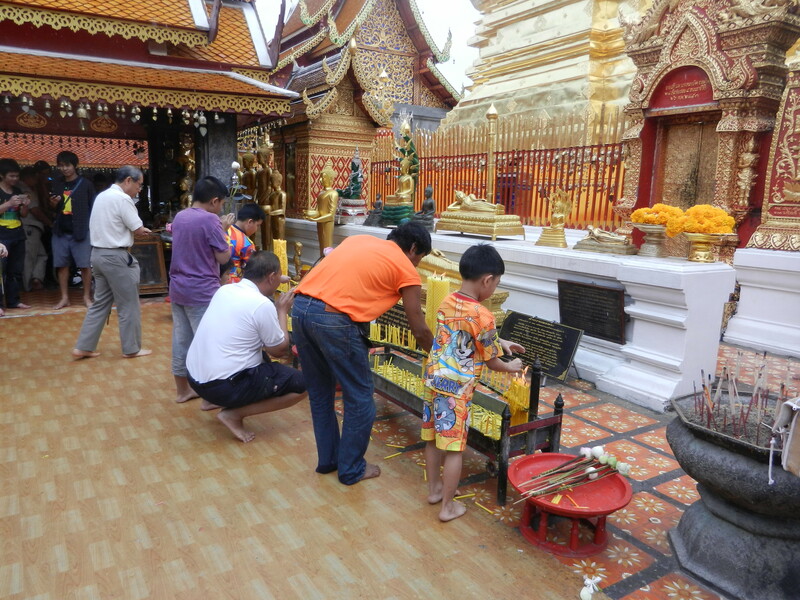 Shrines line both sides of the walkway on all 4 sides of the stupa. People stop at them, burn incense and pray. So motion mixes with vision in a wat. But not any kind of motion. People don’t sprint or break-dance. They walk with a steady and relaxed gate. The beautiful objects with sinuous forms which surround them seem to flow together in a gentle way. 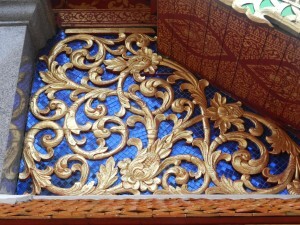 Many Thai decorative motifs, like this one inside a gable, also mix abundance with graceful forms. 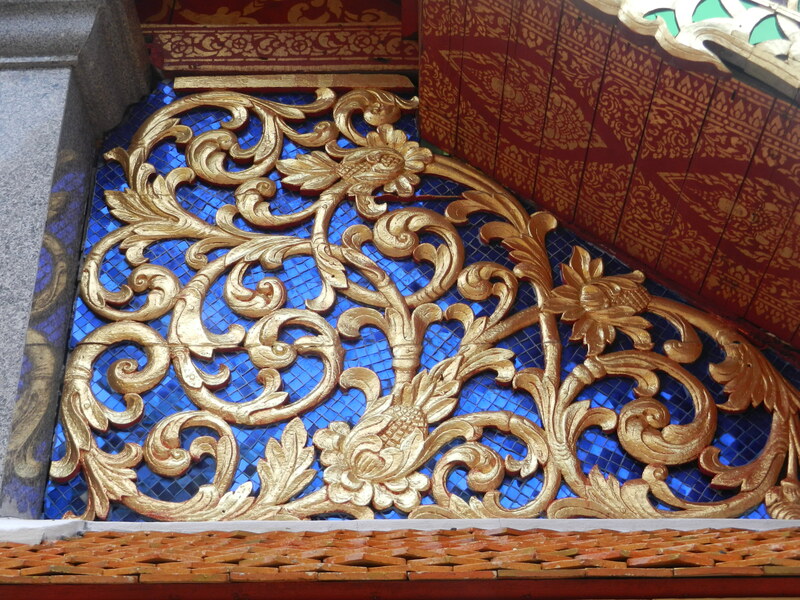 In a Thai wat, the flickering colors and rippling forms mingle with other senses–sounds of birds, the smells of incense, and the warm sun. All senses mesh and reinforce the feeling of an abundant flow of energy that’s both animated and easygoing. This feeling is rooted in Southeast Asia’s ancient landscapes. So what is a perspective? I’d call it the most common way that people in a culture integrate the senses so they can cohere. Each culture’s way is rooted in its ancient past and it converged from many aspects of living in communities within their natural environment. Your perspective, and others’ perspectives have limitless wealth.